The E-Crane is ideal for bulk handling applications that require heavy-duty production cycles. Recently, the E-Crane has proven to be a top solution for grain handling operations all around the world, particularly in South America. In 2013 and 2014, many companies chose the E-Crane as the solution to their grain handling needs. E-CRANE SUCCESSFULLY HANDLING GRAIN AT TERMINAL 6 S.A. 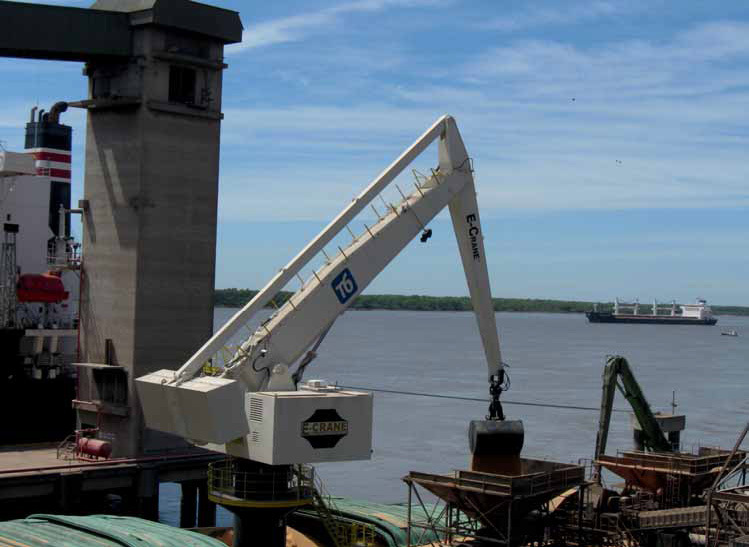 IN ARGENTINA In 2013, E-Crane installed and commissioned a 1500 Series/ Model 11264 PD-E pedestal mounted E-Crane to unload soyabeans and grain from Mississippi and Paraná-sized barges at Terminal 6 S.A. in Argentina. The E-Crane is dock mounted, and has a 26.4 m (86.5ft) outreach and a duty cycle capacity of 16.5 metric tonnes (18.2 US tons). The E-Crane transfers the grain from the barges to a hopper and conveyor system on the dock with a 13.5m3 hydraulic clamshell bucket. Terminal 6 S.A. chose the E-Crane after realizing the many benefits of the equilibrated crane’s efficient design. The goal was to increase the productivity and capacity of the port. The material was originally unloaded using a cable crane and a small material handler, with each machine achieving a production rate of about 400tph (tonnes per hour). The new E-Crane replaced the old cable crane and achieves a much higher production rate than the previous set-up. After the successful operation at Terminal 6 S.A., another Argentinian company realized the benefits of the E-Crane for grain handling purposes. In early 2014, an identical 1500 Series/ Model 11264 PD-E pedestal mounted E-Crane was purchased for a very similar operation. This E-Crane will also be used for unloading Mississippi and Paraná barges into a hopper nearby on the dock. The new E-Crane is scheduled to be installed and commissioned in the first half of the year. E-Crane also provided several solutions for grain handling with barge-mounted E-Cranes in 2013 and 2014. The E-Crane’s balanced design makes it ideal for barge mounting. The E-Crane design is based on a parallelogram style boom which provides a direct mechanical connection between the counterweight and the load. Because of this, the E- Crane remains in a near perfectly balanced state throughout its entire working range. The E- Crane allows gravity to work for you, instead of against you, reducing horsepower requirements and power consumption by up to 50% and reducing maintenance and operating costs significantly. However, along with the significant energy savings that a balanced design provides, it also makes the E-Crane ideal for mounting on a floating barge. Because the E-Crane is balanced, the movement of the E-Crane causes very minimal listing and movement of the barge. A barge-mounted E-Crane is also beneficial because it floats up and down along with the material barges when the water elevation changes. This means that the cycle of picking material out of the barge is never affected by water fluctuation. BARGE-MOUNTED E-CRANES TO HANDLE GRAIN IN ARGENTINA Once again, a company in Argentina realized the great benefits of the E-Crane for grain handling as well as barge mounting. In early 2014, an order was placed for two E-Cranes to be mounted together on a single barge. The first crane is a 700 Series/Model 4264 PD-E with 26.4m (86.5ft) outreach and a duty cycle capacity of 5.5 metric tonnes (6.0 US tons). The second E-Crane, a 700 Series/Model 4290 PD-E has the same duty cycle capacity, but a longer outreach of 29.0m (95ft). Both E-Cranes work together to unload grain from a Paraná-sized barge into two separate hoppers also located on the barge. The hopper outputs the material onto a conveyor/shiploader system which transfers the material into a Handymax sized vessel on the other side of the crane barge. An E-Crane is also to be used for a similar operation in Brazil. In 2013, an order for a large 3000 Series/Model 30382 PD-E E-Crane was placed. The E-Crane will be barge-mounted and will be used to unload material barges. The material will then be directly transferred by the E-Crane to a Panamax-sized ship on the other side of the crane barge. The midstream transfer will occur along the Amazon river and will be the largest midstream transfer operation ever accomplished for E-Crane. The E-Crane will be equipped with a 30 cubic meter hydraulic clamshell grab which will be able to transfer 24 metric tons of grain in a single cycle. 700 Series, 1000 Series, 1500 Series, 2000 Series, and 3000 Series. E-Cranes provide longer outreach and higher duty cycle capacities than typical material handlers. Outreach ranges from 24.8 to 47.8 metres (82 to 157 feet) and duty cycle capacity ranges from 5.5 to 39 metric tonnes (6 to 42.9 US tons). Buttimer Polska has delivered, or is in the process of delivering, grain handling systems for Bunge, Glencore, M.T.M.G. (Morskiego Terminalu Masowego Gdynia), ADM, Malteurop Group and others on Poland’s Baltic coast. Continued growth in the volume of grains and oilseeds imported and exported each year from Poland, the development of the country’s northern coastline, and the ports of Gdansk and Gdynia in particular, have created a vibrant destination for regional and global agricultural trade. Buttimer Polska Sp z o.o. has been working hard to provide expertise in dry bulk handling infrastructure to new and existing terminals, to facilitate this growth. A number of significant projects — completed, in progress and planned — demonstrate the company’s capacity to deliver turnkey mechanical handling solutions and a strong knowledge of the region. Present in the Polish market since 2005, Buttimer Polska is part of Buttimer Group; it both draws on, and contributes to, the Group’s expertise and experience in mechanical handling of dry bulk commodities. Buttimer Polska primarily works with clients handling grains, oilseeds and other agri-industry products. The company is the exclusive distributor of Cimbria equipment in Poland, and works closely with the specialist grain handling equipment producer, and clients, to deliver high-quality and cost- effective mechanical handling solutions. Buttimer’s range of projects and growing client list are the result of a commitment to always deliver a first-class project, and to work with clients as partners, to ensure that their engineering and commercial requirements are satisfied. At Glencore’s ‘Elewator Ewa’ at the Port of Szczecin, Buttimer has provided a heavy-duty belt conveying system, which handles both soyabean meal and biomass. While at ADM’s ‘Baltycki Terminal Zbo owy’ (Baltic Grain Terminal) in the port of Gdynia, Buttimer is designing a mechanical handling system to facilitate the storage, ship unloading, conveying and truck loading of soyabean meal. The handling of soyabean meal requires careful consideration of transfer points, aspiration, ATEX zoning and design of fire safety features in the mechanical handling process. Buttimer has recently secured a number of projects handling soyabean meal, in part due to the company’s successful delivery of a turnkey soyabean meal and rapeseed meal handling terminal for Bunge in 2012, at the Port of Swinoujscie — the design and installation was managed by Buttimer and included the complete aspiration system, loading to trucks, ships and rail with significant handling throughput capacities, as well as storage. The contract announced by Buttimer last year for M.T.M.G. at the port of Gdynia will include multiple soyabean meal handling lines, with two ship unloaders of throughput of 600tph (tonnes per hour) each, elevators, chain conveyors, truck loading stations, process aspiration and over 1.2 kilometres of conveying systems. Design on this project has now been completed with installation well under way. As with all projects, Buttimer’s ability to build strong relationships with clients in the detailed design and procurement phases — getting a thorough understanding of their system requirements — prepares the way for problem-free project implementation and construction, and ultimately, successful delivery to a satisfied client. The most recent project secured by Buttimer’s Polish team is a mechanical handling system for Malteurop Polska’s partnership with Copenhagen Merchants at GBT (Gdansk Bulk Terminal), also on the Baltic coast. The project is likely to involve a grain handling silo storage facility as well as a shiploading and unloading capability. The facility handles grains and meals. Buttimer also has significant malting grain handling experience, having designed and installed the complete dry ingredients handling system at Diageo’s famous St James’s Gate, Guinness brewery in Dublin, Ireland. The opportunity to share and develop expertise across multiple sectors and geographies is one of the core reasons for Buttimer Group’s success in delivering mechanical handling solutions to such a diverse range of clients and projects. The growing dynamism of grain and oilseed trade along Poland’s Baltic coast is seen as an opportunity for the country’s agriculture, industry and trade sectors to transform the northern coastline into a regional hub of ports and agri- industry. Buttimer Polska will continue to deliver high-quality engineering and project management services to the region, growing the handling capacity and trade volume potential of our clients, as well as growing the experience and expertise available to Buttimer Group. Ireland, Poland and the UK have been the principal markets for Buttimer’s services to-date, though there has been growing interest, internationally, in the services the Group provides. Buttimer Bulk Engineering has been developed to make the expertise and experience imbedded in Buttimer’s diverse capabilities available to a wider range of clients and geographical regions; the subsidiary will provide design, engineering and procurement services to mechanical handling projects outside the Group’s primary markets.